Stream banks constantly change position, height, and angle due to erosion and many other contributing factors. Erosion is a natural process and nothing we do will entirely stop erosion from occurring, but many things we do accelerate the process. Many people stabilize banks with rip-rap to reduce stream bank erosion at a particular site. Sediment can affect stream quality in many ways by reducing clarity, filling in the spaces between rocks on the bottom, which reduces suitable sites for fish to lay eggs, and carrying other pollutants such as Phosphorus. Erosion is often a visible process. We can see bank location moving over time and trees falling in. 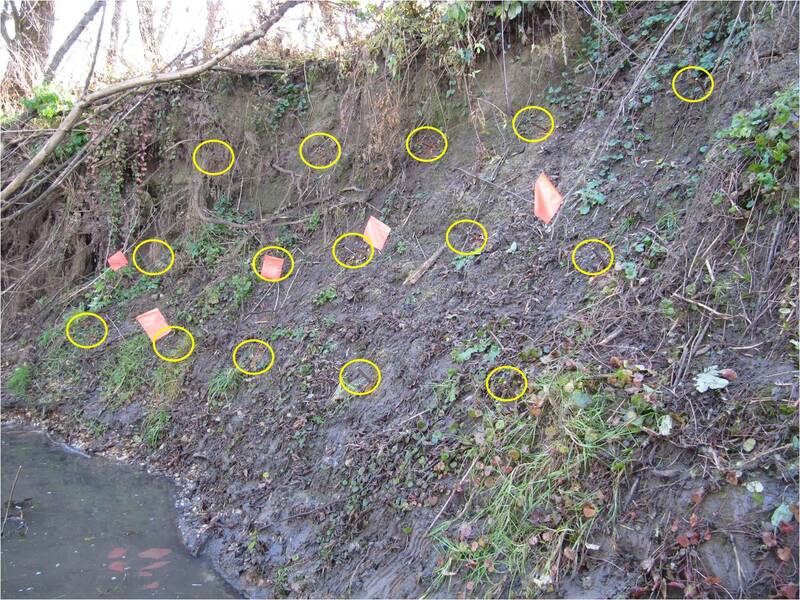 These observations can help us to determine a rough estimate of the amount of soil that moved or eroded from a bank, but there are many simple techniques for measuring stream bank erosion. One of the most simple and most widely used methods for measuring stream bank erosion is the installation of erosion pins. Erosion pins are metal rods (1/4 – 3/8 inch diameter) that are inserted perpendicularly into the bank face with a known amount sticking out. If you start with 10 cm of pin sticking out and you come back in three months and have 20 cm of the pin sticking out, you could estimate that 10 cm of the bank eroded. If the pin measurement was only 5 cm, you could estimate that there was 5 cm of deposition during those 3 months. Curtis Lundy, a landowner in Allamakee County, previously stabilized a portion of bank on the Yellow River and was curious about how much soil is eroding from other sections of stream banks on his property. 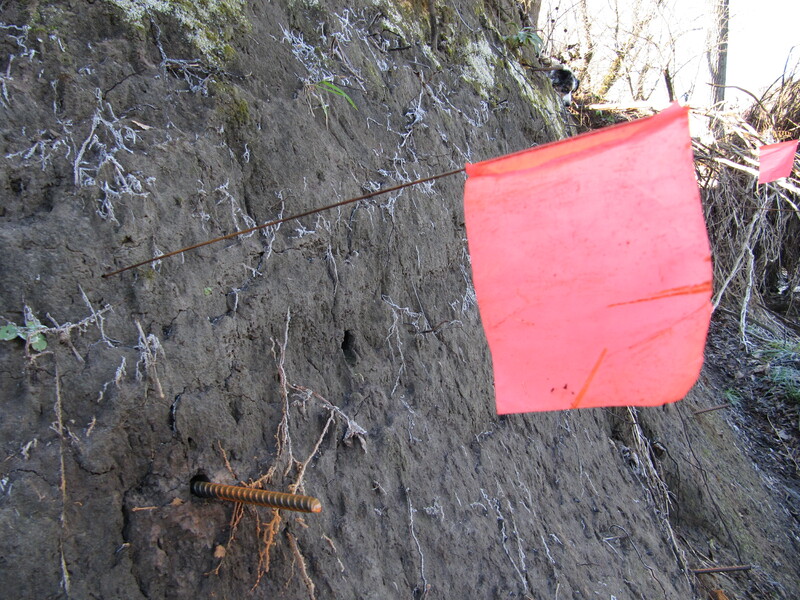 Sara Berges, a watershed technician for the Allamakee County SWCD, had conducted an erosion pin study as her master’s degree research project and suggested this method to Curtis. Within a few weeks, Curtis had pins, mallets, and help ready to install erosion pins. With the assistance of friends, SWCD employees, and Odie the dog, around 85 pins were installed on six sections of bank on the Yellow River and Hickory Creek at the end of October. The pins will be measured at least 3 times a year to determine trends in erosion/deposition. 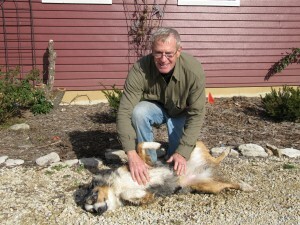 Look for future articles with results from Curtis’ study.